Sarah was born on 12 August 1793 at Mercaston, Derbyshire, daughter of Rowland Kirkland and Sarah Daykin, and baptised at Mugginton on 16 May 1794. Sarah was first influenced by William Bramwell, a Wesleyan Preacher, who preached in her father’s house. She was further influenced by Hugh Bourne in 1811, which triggered her conversion, and William Clowes. From the latter, she received her first class ticket. She became a local preacher in 1813, shortly after her father and two brothers died of smallpox. She was mentored by Robert Winfield of Ambaston, Derbyshire, a farmer and local preacher. 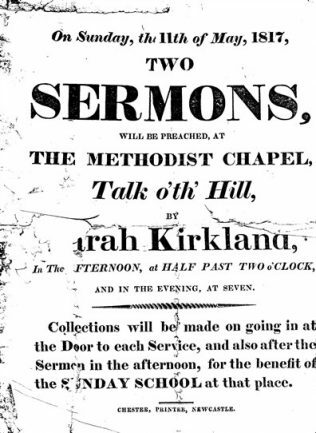 Her first preaching appointment was a Sutton on the Hill. During this service a young gypsy was converted. He frequently would act as a herald for Sarah, publicising where she was to preach and what the Lord had done for him through her. She developed into one of the pioneers who introduced Primitive Methodism to Derby, Nottingham, Ilkeston and Hucknall Torkard. In the latter village, Barber relates that in a lively centre of Luddite sentiment she succeeded where others failed. In late 1815, with Winfield alongside, she first preached in Nottingham. They entered the city and Winfield encouraged her to start to preach in the Market Place. This initiated the development of PM work in Nottingham. In May 1816 she spoke to a gathering of over 12,000 at a tent meeting in Nottingham Forest. She was appointed the first women travelling preacher in 1816, paid 2 guineas per quarter from Hugh Bourne’s own pocket. 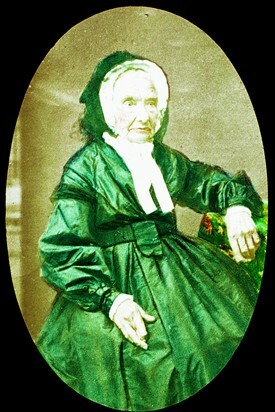 She retired from itineracy in 1820, when her husband became ill and as a consequence is not recorded on the stations. Sarah was invited to return to Hull after John died, but declined. Sarah continued her ministry as a Local Preacher until her death. She married John Harrison on 17 August 1818 at Bingham, but he died on 22 July 1821. (John Harrison was also an early PM Itinerant Missionary.) She then married William Bembridge (1804-1880) who was also from Mercaston and a Local Preacher. They had one daughter, Ann, born abt 1825 and a son, John, born abt 1833. Sarah died on 4 March 1880 in Alfreton and was buried at Mugginton, Derbyshire.